Reading the 4th Countess’s of Carnarvon’s diaries in her lovely clear script, I have begun to understand a little more about life here 130 years ago. Some things never change. The family liked going for walks or riding on their horses, perhaps up Beacon Hill as I did yesterday evening. They were keen to ensure they spent time outside and considered it was good for their health, for their “constitution”, so much so that if the weather was miserable, they walked in the dining room for 30 minutes! The thought of Lord and Lady Carnarvon, arms linked, walking round their table in circles talking over their plans strikes us in the 21st century as perhaps faintly comical. Jane Austen of course wrote about her heroines walking up and down a room and the 4th Countess’s diaries prove it happened for real not just in books and films. Perhaps this dedication is the reason the Victorians were so enormously successful. 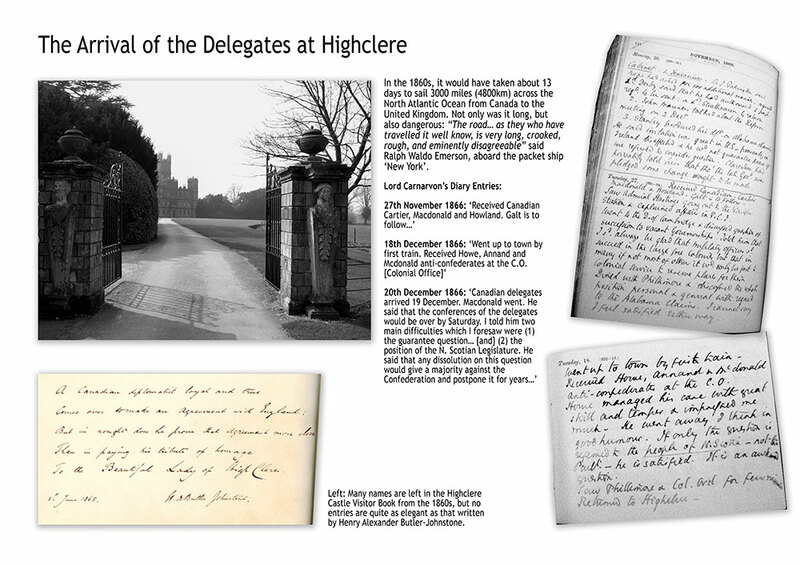 I had been wondering how to present Highclere’s story and role in the British North America Act of 1867: the Canadian Constitution, so I thought I too would take a walk around the Castle. 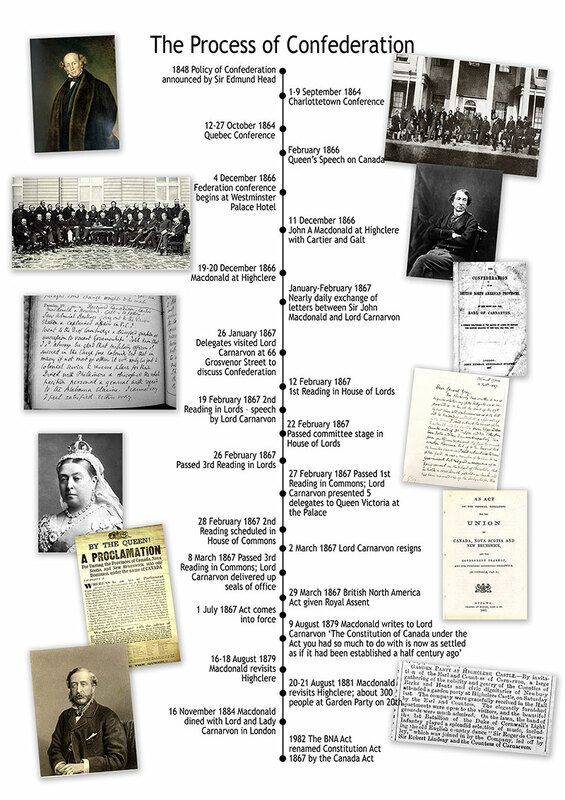 Following days of research and with the help of young Robert, David our archivist and Duncan’s printing efforts, we created a set of graphic boards with timelines and anecdotes to share the Canadian Delegates’ journey across the Atlantic to visit the 4th Earl of Carnarvon who was Colonial Secretary at the time. The result of the following months of discussion was, in his own words, “one of the largest and most important measures which for many years it has been the duty of any Colonial Minister in this country to submit to Parliament …” It followed the detailed work and thought, the compromises about the construction of the Senate, Clause 93, the Intercontinental Railway, it was all therefore effectively the backstory to July 1st 1867. Lord Carnarvon had received several suggestions from friends regarding a new name for this landmass including ‘Franklin’ and the rather more interesting ‘Guelfenland’ whilst Sir John A had preferred the “Kingdom of Canada”. 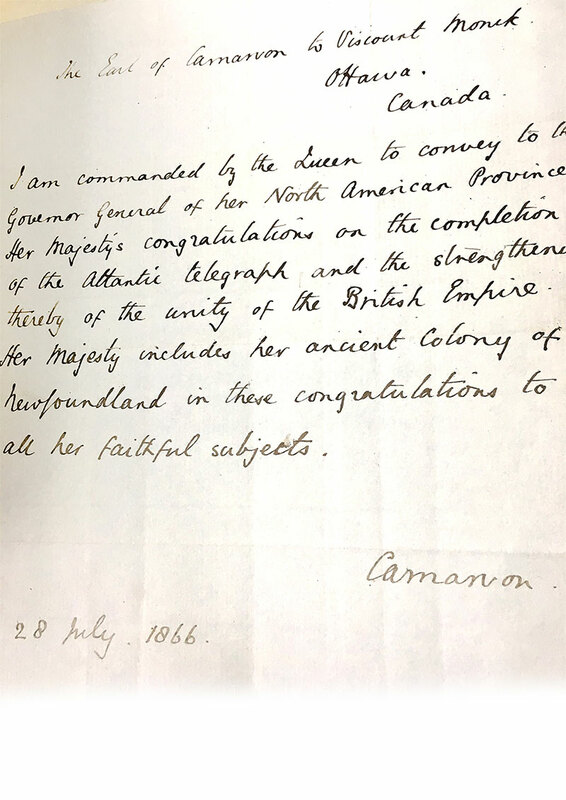 Lord Carnarvon found a compromise and on 8th February 1867 Her Majesty Queen Victoria gave approval to the name ‘The Dominion of Canada’ under which to gather these provinces. Far greater experts than I have analysed the political detail of this great bill but I wanted to become more familiar with the men who built it, who sat round the dining table we still have and discussed the clauses over dinner, who argued over the precise wording of sentences over coffee and cigars in the Library and who went for their “constitutional” walks around our gardens when they needed to clear their heads. The key man was Lord Carnarvon: seeking to help draft in words protection for the minorities in Upper and Lower Canada, who tried to argue for limited tenure of term in the Canadian senate as opposed to Macdonald and Cartier who wished to propose it for life. 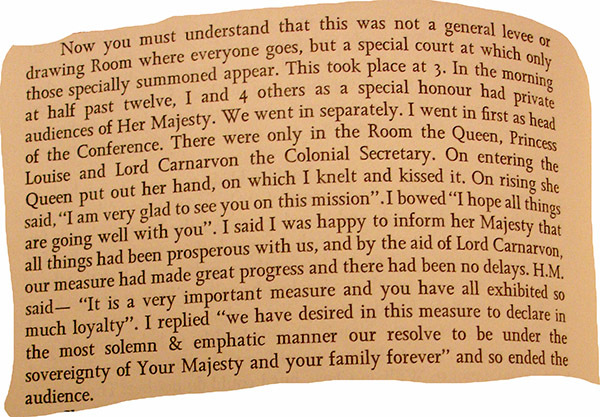 Carnarvon’s diaries and letters to General Grey (Queen Victoria’s Private Secretary) reveal the thoughts and compromises, who left the room to disengage for a time in order to find the space to resolve a point. My research also revealed the quirky side of these great matters of State: what Mr Galt should wear to meet the Queen, why Ottawa became the capital, the scribbles over papers and initials agreeing a point and Lord Carnarvon’s speech about the beauty of Canada. We also found some engravings in books in the Library which highlight the antiquity and beauty of the Canadian landscape at the time. It has all been absolutely fascinating. Please download some additional information including original documents and photographs. This is wonderful! I’m a proud Canadian, and find it interesting to read of the coming about of Confederation from the British side of things. And to think that Highclere, via Lord Carnarvon, had a hand in it all. I did not know this before! It would be wonderful to walk around that display at Highclere, but seeing this post is definitely second-best! I have attached some PDF’s to download at the end of this email..
What a glorious thing to read today of all days as we celebrate the 150th birthday of our amazing nation. Thank you again for bringing history to life! Happy Canada Day and here is to the next 150 years…. Dear Lady Carnarvon , thank you so much for sharing that and all the work you put into it . I’m a proud Canadian with many British ties . My maternal grandmother immigrated from Shrewsbury with her mother in 1900 when she was 5 years old . My great grandmother was unwed and the story that has been handed down is that she was given a large sum of money ( which she used to open a store in Toronto ) and told to leave England never to return . She flipped a coin , heads for Canada , tails for Australia . Sadly she never revealed who the father was and I’ve always wondered about the ” lost ” side of our family in England . My sister and nephew moved to Oxford over 20 years ago as well as several cousins so I try to get over as often as possible . I hope to visit your lovely home one day and really appreciate you posting this information . Have a lovely week ! Sincerely , Ruby Corman ( proudly named after my English grandmother Ruby Wilde , sadly she died at the young age of 60 when I was 1 year old ) . I am proud – and humbled -to think Lord Carnarvon and Highclere had a part to play. Thank you so much,again from another proud Canadian on our 150th birthday. I found the reference to “Guelfenland” particularly interesting as I live in Guelph, Ontario which was founded by John Galt whose son you make reference to became one of the Fathers of Confederation. Thank you, how interesting – I had no idea where the name came from! Not being an historian, I tend to wander off into space when listening or reading. However, I was riveted by your snippets of letters and accounts of the parliament speeches. All your efforts will give people an insight into a part of history they may never have known about, in Canada or the UK. Kudos to you!! Here is an excerpt from a blog I wrote on a concert in Salisbury Cathedral in October 2014 honoring the Canadian soldiers of the first world war. 2014. Since the clocks moved back last Sunday, with lighting only on the walkways surrounding the cathedral, it gets very dark even before Evensong. It had been drizzling for a while, making the area around the cathedral very misty. The view of the yellow sandstone cathedral with the mist swirling all around and up to the spire, which is engulfed by it at the top, is breathtaking, making a perfect backdrop for Halloween. Tonight in the cathedral is the concert by the Canadian National Arts Centre Orchestra. Pinchas Zukerman is conducting and playing. It is to commemorate the 600,000 Canadian soldiers who came to England to help in the First World War, almost a hundred years to the day. 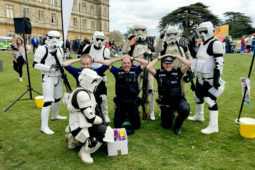 It was especially important to Salisbury, as the soldiers came to prepare for war on Salisbury Plain. Here is a brief description of the Canadian Army coming to England. The Canadian Division, consisting of the Princess Patricia’s Canadian Light Infantry, and the Newfoundland Regiment, were taken by the fleet of 33 Atlantic liners assembled in Gaspé Basin off the coast of Quebec province for a rendezvous with their Royal Navy warship escorts. On 3 October, 1914, the transport ships steamed ahead out of Gaspé Bay in three lines led by the Royal Navy warships. Making its way up the St. Lawrence seaway the convoy passed through the gateway of Canada, the Gulf of St. Lawrence. As it passed the Avalon Peninsula of Newfoundland, the sealing-ship SS Florizel, with the Newfoundland Regiment aboard, joined the fleet. As the army set sail for Europe it was the first time that such a large contingent of troops had ever crossed the Atlantic. The voyage was uneventful and long. The fleet entered Plymouth Sound off the south coast of England on the evening of 14 October 1914. Censorship about the arrival of the Canadian Armada had been so strictly controlled that the fleet was completely unexpected by the local people of Plymouth and Devonport. However, word quickly got around that the Canadian transports had arrived and the townspeople flocked to the waterfront to cheer. When the Canadian troops disembarked they marched through the streets to a warm welcome. However, they endured a long miserable winter training in the mud and drizzle of Salisbury Plain. There they spent four dismal winter months in the mud, cold and rain. On the sodden fields, in the fog and mud of the battalion lines, in the dripping tents and crowded, reeking huts morale was low and sickness was common. But once the rains stopped and training could begin properly the men of Canada gave promise of the great spirit they possessed. They displayed a spirit of endurance, courage, and willingness that proclaimed them to the world as troops of the finest quality. In the spring of 1915, they were deemed ready for the front line and were razor-keen. Nothing, they believed, could be worse than the Salisbury Plain. In the years that lay ahead, they were to find out just how tragically wrong that assessment was. I have a most moving letter from a Canadian mother from Winnipeg thanking Lady Carnarvon for looking after her son 3,000 miles from where she was – it nearly makes me cry every time I read it. He survived. There are many links here across the ocean, of words and friendship shared. Thrilled to hear of the Dining Room Walks! Now I don’t feel so goofy for my indoors walks! I’ll pace back & forth in a long hallway when it’s too hot or rainy to go out. Thank you very much for coming. I have loved the research, but I do know how much more I have to do !!! Thank you so much for posting this as I so wanted to join you all for this special occasion and simply could not. The work you put into this is obviously appreciated and assists me personally in the recall of our Canadian history. I hope you will keep those boards so we can enjoy them at a later date. You and your efforts are a treasure. I am sure my or our journey has just started. I have more anecdotes and more stories and diaries. This is living history! I am thrilled! Thank you so much! A Great read! Thank-you. It’s always nice to hear that great things come from such simple beginnings. I chat while taking a walk or sitting and talking over a glass of wine before dinner. Did not know this huge piece of history. Thank you for sharing. Got to spend last night in Connecticut celebrating our Independence weekend with some Canadians. I have to let them know about this blog! Please do and I put 3 or 4 PDF’s below of the exhibition boards – it is a start and I can build from there I hope. During his life, he considered every kind of future for Canada — annexation by the US, continued colonial status, republicanism, and finally toward the end of his life he became an Imperial Federalist (about the time he co-founded our city Lethbridge, Alberta, Canada and opened his Alberta mines to bring people to what was then the SW part of Northwest Territories). By thy dear name to be hereafter known. I suspect that the Elliot in the Diaries is Elliot Galt, the son of Sir Alexander Galt. Elliot was attending Harrow and he attended the London Conference. He and his father co-founded Lethbridge Alberta Canada and were responsible for the settlement of much of SW Alberta. Interesting material about the Fenians. Many people in the UK don’t realize that Canada was under attack from Fenians for decades, even after Confederation. (They came up from the border through the US, first thinking they could get the Quebecois to support them. The Quebecois wanted nothing to do with the 13 Colonies, because one of the irritants that sparked the American Revolution was the Crown’s decision to give Catholics and Francophones equal rights in the Colonies. The Americans in the 13 colonies were opposed to granting Francophones equal civil rights, just as they were also opposed the Royal Proclamation of 1763, which forbade settlement of Indian Territory. 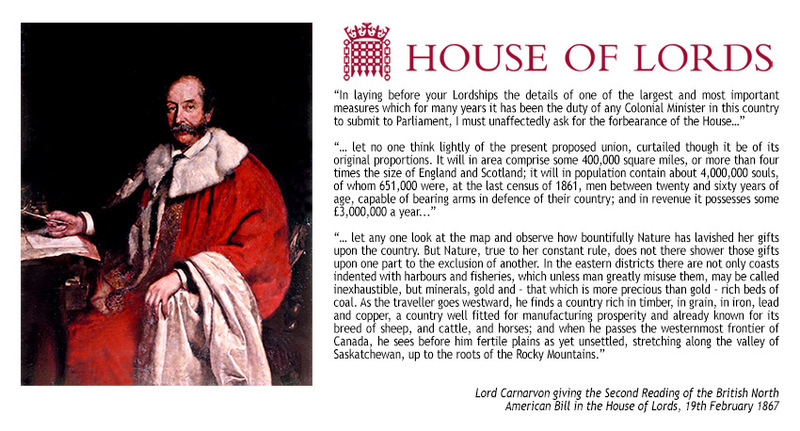 The Royal Proclamation is still Canadian Law. This is why Canada has remained a realm and, in 1982, the Canadian Crown, was entrenched in the Canada Act. Another thing that makes up the Canadian identity is a large population of people descended from Protestant Loyalists from Ireland, United Empire Loyalists who moved north after the American Revolution, and royalist Scots. Those groups, along with the Quebecois, basically ran the BNA colonies, and there were way more of them than there were English colonists. So, it was imperative that the Canadian colonists find a way to keep their chosen form of government, while mitigating the constant risk of invasion from the United States. Confederation did this. 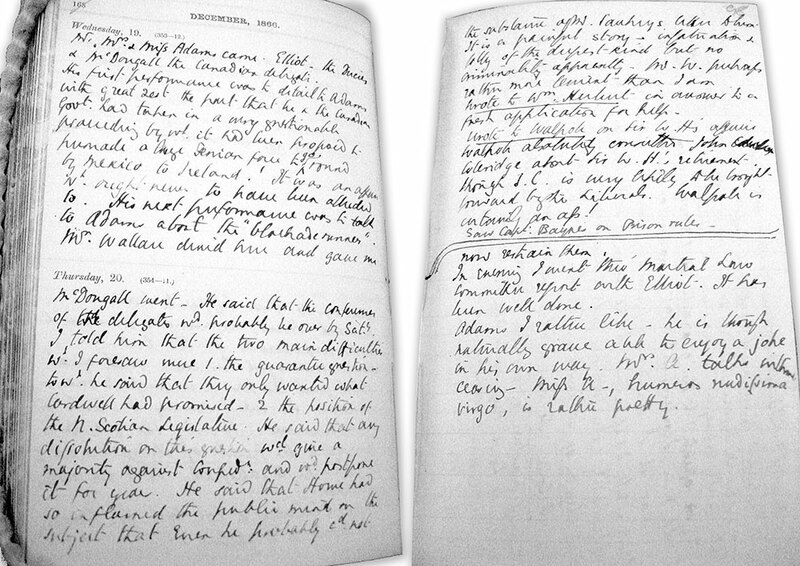 Your comments above are reflected in the letters and diaries between John A and Lord Carnarvon. One reason for the expeditious BNA negotiation was the real fear of the Fenians. Lord Carnarvon thought there was a time and tide and piloted the bill through….There are letters/diaries about Realm, Kingdom, Dominion and Republic . I rather need an intern to start typing up!!! George Brown, the father of Confederation who married Anne Nelson (Thomas Nelson Publishing) and founded the Globe Newspaper (The Globe and Mail) had his share of differences with them as well, but they all united to further Confederation. All of these people were Scots, except Cartier. My aunt Jill Manley of Newbury told me about Highclere’s association with Canada when I visited her last month. Although I was not able to come to Highclere this summer I am anxious to do so on my next visit. Sir John A was a larger than life figure who adds not only historical weight but vivid colour to the history of our great country Canada. Having worked for several years as a lawyer in Parliament in Ottawa and being an avid reader of history, I am thrilled to know that the story of our nation and how it was birthed not only in Canada but also in Britain, continues to be discovered from varied perspectives. Congratulations on all you are doing and the obvious joy that goes with it! I had not heard of Highclere castle before Downton Abbey. it does my heart good to know you and your husband are taking on the enormous task of rescuing such an important part of history. Not just for your family but for Canadians. Your history really represents a huge part of the birth of my country, you have no idea how pleased I was to learn this. My birthplace in Canada intersects with this history. GALT Ontario, now Cambridge! I hope to be able to come one day, just to go for wander, feel the history, admire the architecture, and enjoy the view, znd to thank both personally for your brave undertaking! Thank you – this has been a great story but more than a story too! 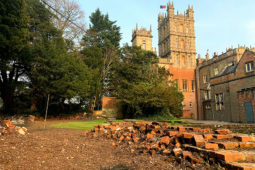 Upon reading this thread, I am gobsmacked that Canadians have a connection to the resident caretakers of Highclere Castle, of old. I too, am a proud Canadian, and upon reading this historic account of John A McDonald visit, I am smiling even more. Thanks to the TV show being filmed in your beautiful Historic residence… I see we Canadians have more to thank your ancestors for. Not just a fantastic show, of clean entertainment, but a most wonderful historic moment, found in within the walls of Highclere, forever recorded in historic papers. Thanks for delving deeper into this, a topic that connects canadians to a piece of Highclere, forever, proudly! One more reason, though; I have enough already!~ on bucket list~ to one day visit your beautiful estate, which obviously you care deeply for. 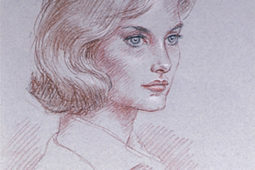 Now the global audience, knows of… and loves your beloved Highclere, and will for Generations to come. Now I am perusing your Gift shop, and feel compelled to order a few items, which will make me smile, as I will use often, and fondly share this history (you have uncovered)of this wonderful historic Canadian connection to your Highclere! 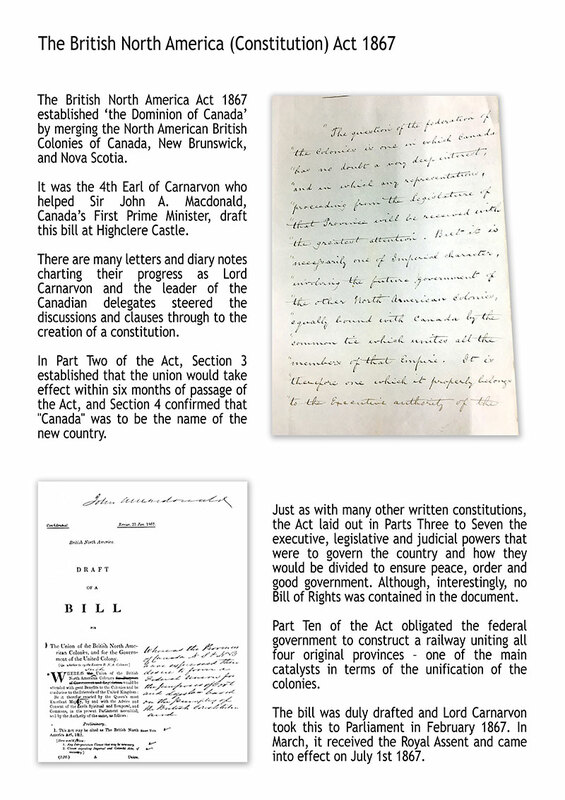 I have put together a booklet on Canada too which we sell in the gift shop – copied of some of the letters/ telegrams in case your are interested.